Ever since I’ve consciously tried to eat healthier, salad has become my rice. I eat it almost everyday and I like adding ingredients that make it interesting and even more appealing to me. But the thing about preparing my own salad is that I only use two different kinds of dressings- balsamic oil & roasted sesame. Sometimes, what we think is healthy can actually have more, if not similar calories that of a burger or other fast food. One of these things are salad dressings or canned sauces that are available in the supermarket. Good thing more and more home made, natural brands are becoming available for those of us who consider shifting to a healthier lifestyle. 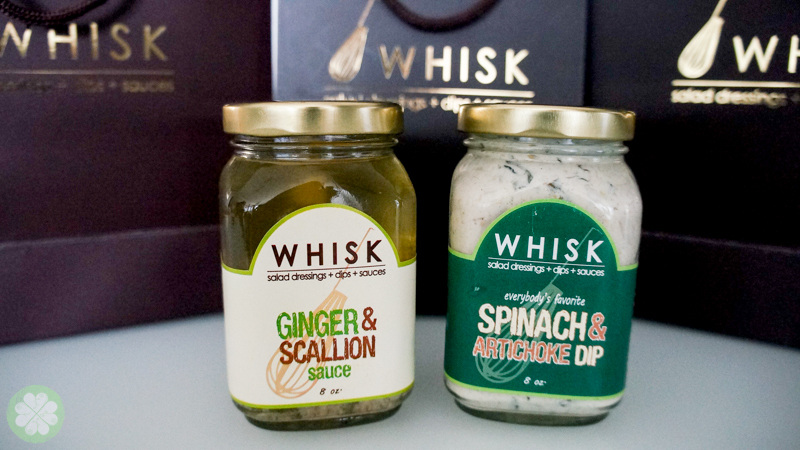 Let me introduce you all to Whisk Salad Dressings, Dips & Sauces. Whisk started out in October of 2011. Created by best friends with extensive culinary backgrounds, Chef Czarina Yu & Chef Cheryl Lim. 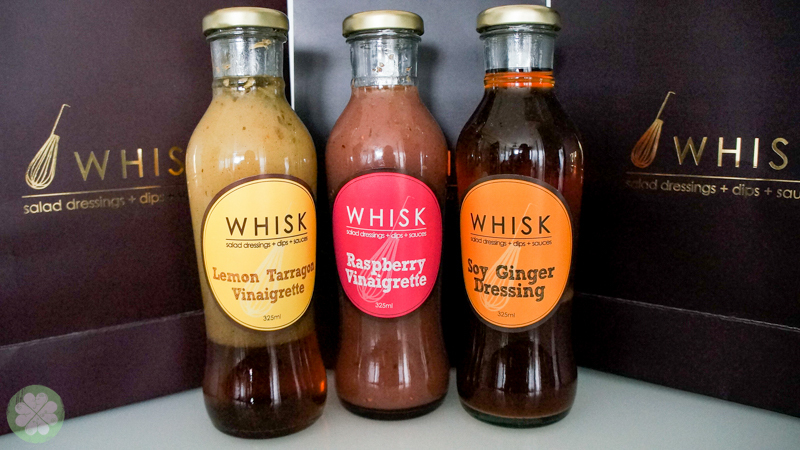 They decided to pursue their love for food by creating salad dressings, dips and sauces. They believe that sauces are integral in every meal and wanted to create home made sauces that are easy to use at home. Thus Whisk was born. Their products are made with local and imported ingredients and they pride in using high quality natural ingredients as much as possible- no chemical preservatives. They believe that food taste better and healthier too and this is exactly what to share to their clients. 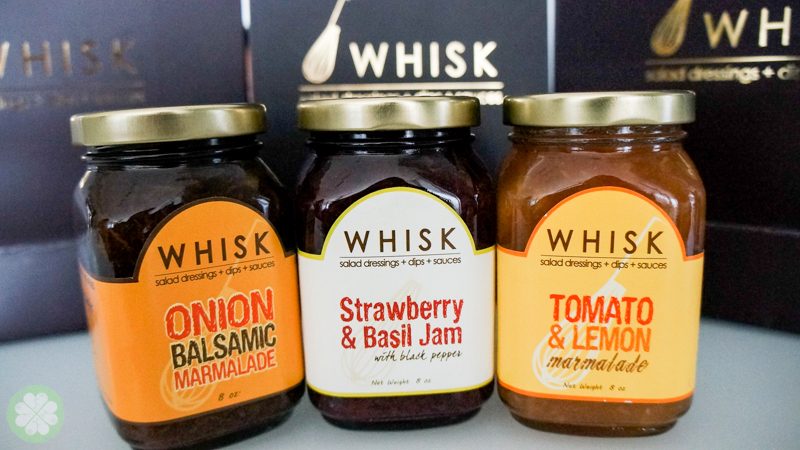 I’ve passed by Whisk’s kiosk at Robinsons Magnolia over the holidays but really wasn’t able to take my time to try their products, so when Cheryl sent me their best sellers I was super happy to try them. Spinach & Artichoke Dip. It’s good for melba toast, chips, veggie sticks, or put on top of baked salmon. Onion Balsamic Marmalade. Want to make those plain ol’ burgers a bit more gourmet-ish? This is how you do it! Top this on burgers, steak or pair with cream cheese on melba toast. Strawberry Basil Jam. Best partnered with peanut butter or cream cheese. Great to smother over croissants, waffles, pancakes or vanilla ice cream. Tomato & Lemon Marmaalde. Pair it with brie, crackers and candied walnuts. It goes well too with cream cheese, use in ham sandwich or as glaze for pork chops. 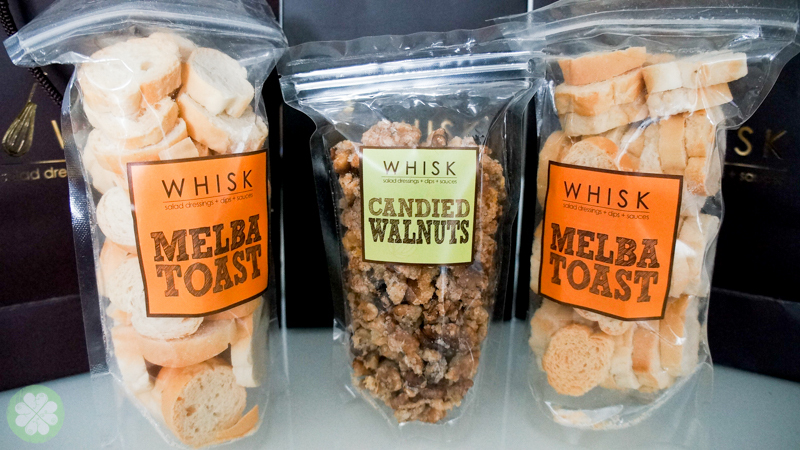 Whisk also has melba toast & candied walnuts to pair with their marmalade, jams & dips. Lemon Tarragon Vinaigrette. Salad mix of calamares, baby spinach,rocket, mandarin orange. It can also be used as a seafood marinade. Raspberry Vinaigrette. Salad mix of romaine, rockets, berries, candied walnuts. It can also be used as a baked chicken marinade. Soy Ginger Dressing. Salad mix of lettuce, carrots, cucumber, grilled chicken, friend wonton strips. It can also be used as a scallops marinade. Currently they have a kiosk at the weekend bazaars at Robinsons Magnolia, SM Aura, and Alabang Town Center. They’re also available at Urban Pantry in Promenade, Greenhills, The Green Company, M. Paterno, San Juan and Echostore Centris, Serendra and Salcedo. Call or text to order at 0917-8771948. Pick up in New Manila or Roosevelt Area. They also offer shipping (nationwide) except for Spinach & Artichoke Dip, Ginger & Scallion Sauce and Jalapeño Corn Salsa as these are refrigerated items. been using some dressings from another brand, i haven’t tried these….it looks yummy and promising …. Hi Ms. Jackie, i am interested to order salad dressings as well as try the sauce and jams. Is there a kiosk nearest to molino cavite area where i could buy your products? Need for the coming holidays as a give away and for celebration purposes? Hi Jo! You can get in touch with Cheryl or Czarina of Whisk Salad & Dressings at 0917-8771948 or email them at [email protected] 🙂 Thanks!